Happy Memorial Day Weekend to all of you. I am so happy to be taking part in Operation Write Home’s Memorial Day Sketch Bloghop. As I wrote in a previous post, I love what Operation Write Home is doing. For those of you who aren’t familiar with Operation Write Home, they provide hand made cards for soldiers deployed overseas to write home to their loved ones on. It makes it possible for the soldiers to send birthday cards and other special occasion cards as well. As you can imagine, there aren’t too many shops selling cards in the middle of the desert or the mountains. Operation Write Home does this through the help of hundreds of paper crafters and card makers who create and donate the cards they make to them. I love this idea. My husband has been deployed twice and I would have loved to have received a beautiful handmand card from him. It would have been something that I would have treasured and kept. Skype is great, but it’s so nice to receive a handwritten note. I’m still a beginner card maker and enthusiastic learner. 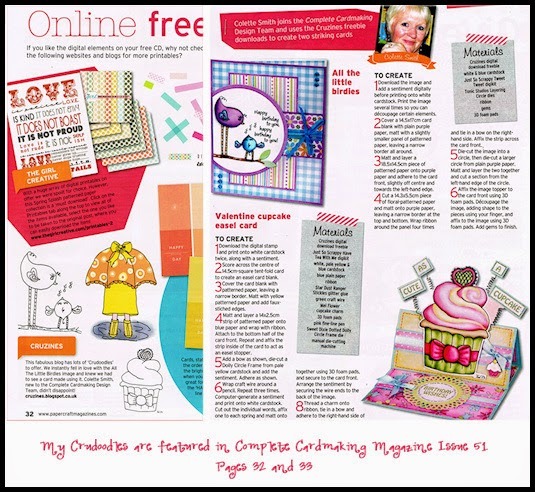 I’ve made two cards with two of my free Crudoodle Digital Stamps, which are available on this blog, and Anna Griffin papers. You can find the Giraffes In Love digital stamp HERE . You can find Her Nose In A Book digital stamp HERE. Thanks for stopping by! Please hop on to the next blog. Click the badge below. Posted in Uncategorized and tagged blog hop, card making, Crudoodle, Crudoodles, digi stamp, digital stamps, Memorial Day Sketch Blog Hop, Operation Write Home. really nice cards. My favorite is that second one. Such a sweet image! Great cards and such cute images! As an avid reader since I was a kid I can totally relate to the "Nose In A Book" and that little blue bow is a perfect finishing touch. So nice too to hear that handwritten notes still mean something in our very digital world. Thanks for joining in the Memorial Day hop and for supporting OWH! 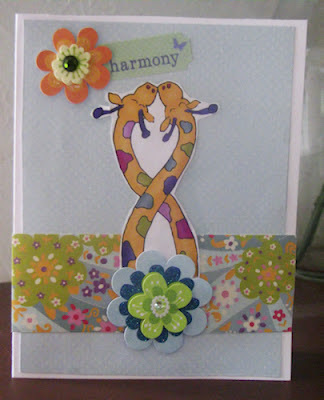 Those entwined giraffes are too cute and I love both of your cards and digis! You're doing a wonderful job for a beginning card maker! Keep up the great work!! Sweet cards and thanks for the digis! I'm an avid reader and delight in seeing my little granddaughters with their noses in books. Such pretty cards! I love to read too!! Blessings! Adorable cards! Thanks for the freebies! I, too, have always loved to read since I was a little girl! If my nose isn't in a book, it's in the Kindle!! God bless! The little girl reading is so cute. Reminds me of myself walking around with a book in hand! What lovely cards , beautiful coloring as well. Sure wish I had the means to do that! I have my nose in a book while I do this hop..lol! Thanks for sharing and a special thanks to you and your husband for your service! (Because, of course, families serve too!) Have a super Memorial Day weekend! Beautiful cards, Tori! I'm a retired teacher, so I'm partial to the little girl with her nose in a book. Sweet! Cute cards…love the intertwined giraffes. Great cards Tori, thank you for the free digital images too! Thanks to you and your husband for your service and sacrifice. Cute cards! I just love the image of the little girl with the book! Thanks for supporting OWH today! Aaaww, they're both so cute!! Thanks for hooping and most of all for the service of your family!! The little girl with her nose in the book is absolutely adorable! Great cards! Pretty darn good for a "beginner". I love the sweet giraffes- they're too sweet. I thank your hubby for his service and I thank you for standing by and keeping his home life secure while he was doing the same for the rest of us. Big HUGS. Great take on the sketches. Oh my stars!! Is there anything cuter than those giraffes?? Love that giraffe card. I love Cruzines images too. . . Thanks for the inspiration! Lovely cards and so cute too! Such sweet cards. The giraffe image is adorable. Great cards love the giraffe image! TFS! oh, these are both so cute. That was very thoughtful of you to include the freebie links too. Thank you. Very cute cards! Did anyone else mistake the giraffes for snakes like I did? It was only for a minute though (giggle) The 2nd card just steals my heart. What a sweet image. Cute cards and the images are adorable! Great use of the sketches. Beautiful cards! Thank you for the digi images and the inspiration. Thank you to your husband for his service! Wonderful job on the cards! Love the papers and the images are super sweet! 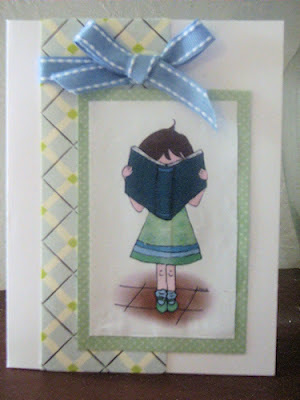 Definitely my favorite is the "nose in a book" card … I was just like that little girl at one time! But also love the colors and patterns you used, and the bow tied around just the argyle plaid panel. Really a nice accent! Thank you to you and your husband for his service to our country. Loved your cards, both of them. (I'm still that little girl in the second one!) Thanks for supporting OWH and all of our Heroes. Perfect papers on the second card…love that image…is it pre-colored? TFS!!! Thanks for hopping with OWH!! I love "her nose in a book" – that was me, too! Thanks for supporting OWH. Yes, I do have a colored version of it, that I did digitally here on the blog. hehe I should probably do something with snakes. Thank you so much. Thank you for stopping by and taking the time to comment. Very cute images and great cards. Your cards are great. Loved the intertwined giraffes, but the little girl with her nose in a book is my fave. I am an avid reader and so is my oldest granddaughter. Just may need to go get that digi, lol.